Card base: 4 1/4 " by 5 1/2". 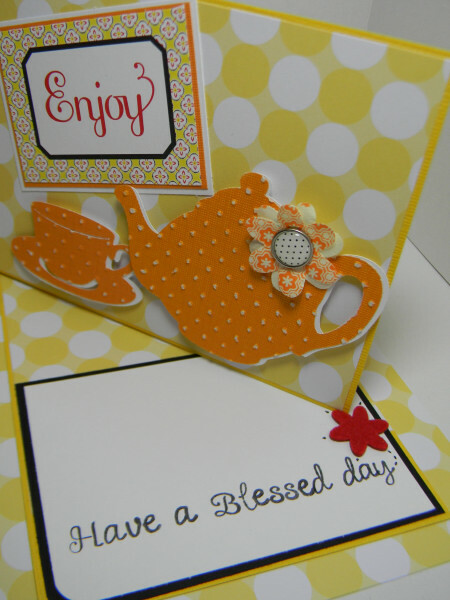 Yellow polka dot mat: 4 2/16" by 5 5/16"
Coffee pot and cup with saucer: A Child's Year cartridge at : 2 1/2" and 1 1/2 " respectively, the same size was cut in white and I staggered them to create the shadow. I also used the Swiss Dot folder to dry emboss the orange layers. 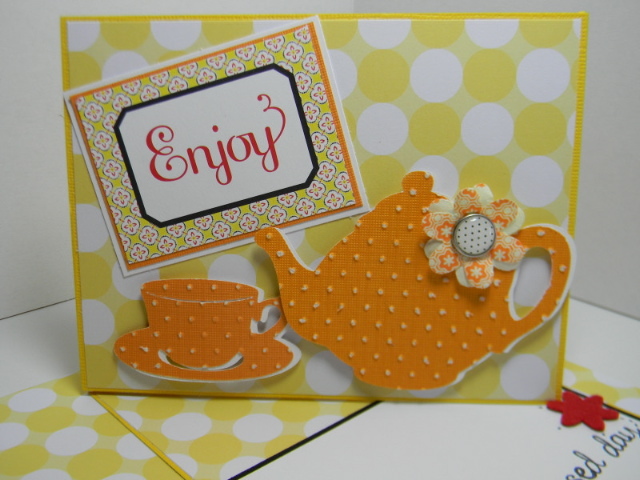 "Enjoy" sentiment from Cosmo Cricket is double matted in orange and white cardstock in 1/16th increments. Flowers are from My Minds eye, brad is from my stash. I used same polka dot paper to mat the inside, and added a double mat of black and white paper for sentiment cut at : 4 2/16" for the black, and 3 15/16" for the white. Alphabet stamps for sentiment are from Studio G. Felt flower is from my stash. Enjoy! The challenge is to make an Easel/ Pedestal card. Both pictures are of the card when opened. The little red felt flower will keep it standing. Fab job on your easel card!! the colors are beautiful and the cuts you used...awesome! love the colors and all the texture! Great Card - I love your use of yellow - so bold and fresh. Thank you for the kind words on my blog! This is beautiful! 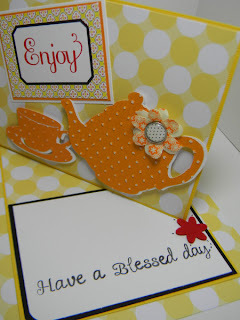 I love the yellow and the teapot cut. Thank you so much for playing with us at Paper Playtime!